At some point in my middle school days I just gave up on Pokemon since it seemed like it was a never ending cycle of nothingness- besides the Orange Cup, Ash will never win a Pokemon League and Pikachu will always reset to level one, etc... I avoided watching Pokemon since the introduction of the fourth generation of Pokemon. After a few years, Pokemon: The Origin popped up and I decided to give it a watch because I wanted to watch a mega evolution animated and see a different take on how Pokemon: The Origin's story was presented compared to the main series. The first thing I was happy to get knowledge of was Ash was not part of this special, and thank God because after a good 10 years of watching him I needed new blood...haha. Instead of Ash we get Red, and we follow the story through his eyes. If you've played Pokemon Red, Blue or Yellow, the special is pretty much a mirror reflection of the game sequence. I liked how in the special, people acknowledged that there are Pokemon of different levels (the main series seems to never mention this). And if you know of cubone's pokedex entry/description, one of the specials was decided around that pokedex entry; which I loved, though I'm not sure if many people picked up on that. 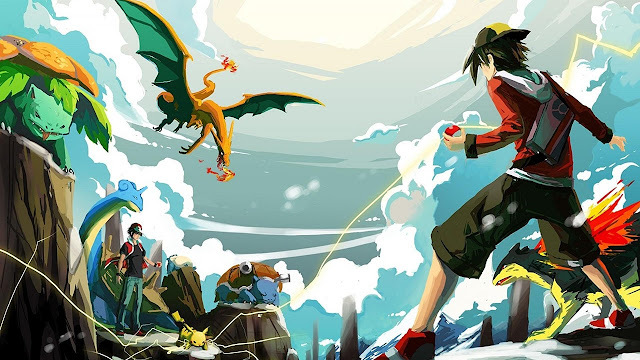 And finally after Red defeats the elite four, and Green, we see him and his six Pokemon being entered in the Pokemon Hall of Fame (I wasn't kidding when this special mirrors the games); it was time for Red to finish off the pokedex and capture Mewtwo. It's at this point where we see Mewtwo and Red's charizard go at it. Best moment in the anime was seeing charizard evolve into charizard X while fighting Mewtwo. I wished the animation was a bit better because charizard X looked so amazing that I felt like a bit more pizazz could have been injected into the animation. Overall I think Pokemon: The Origin was a job well done. If you're a Pokemon fan or an ex-Pokemon fan, you should give Pokemon: The Origin a watch (it's only four episodes). It kind of gives off a different perspective in terms of the storytelling and if you want to watch a complete story, and seeing Pokemon undergoing a mega evolution without watching an entire season of Pokemon X and Y, Pokemon: The Origin is your best shot. Thanks for reading, that's it for this review. If you've seen this special, or love Pokemon please comment down below and tell me your thoughts! and if you say that "Pokemon Origins" is so good, I'll give it a try. Haha, I don't think I said it was "so good." I thought it was just a bit different and done well.